copper clad laminate, various electronic parts, micro controlers, wires, connectors, speakers, variable dimensions. The structure is reminiscent of a neural network and its synaptic transmissions. 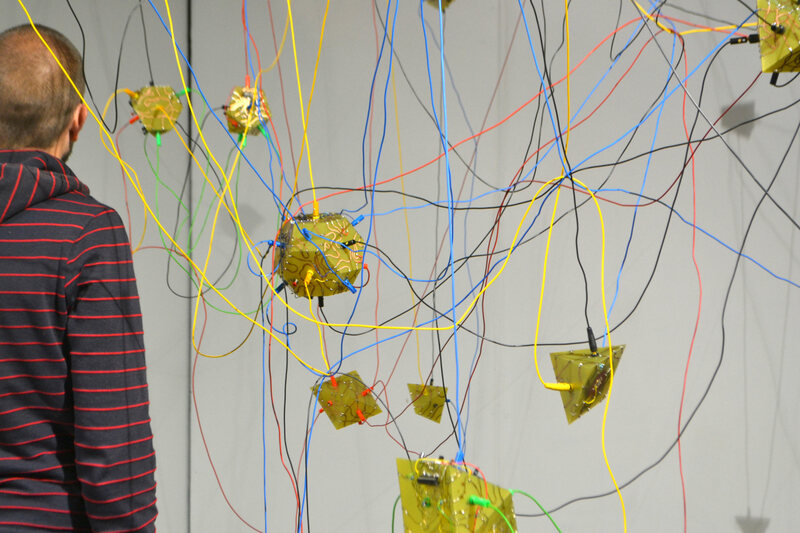 The installation consists of several interconnected electronic devices - sound generators, spatialization unit, controllers, etc. - in the manner of a modular synthesizer patch. The function of each module determines the number of connections, faces and shapes. 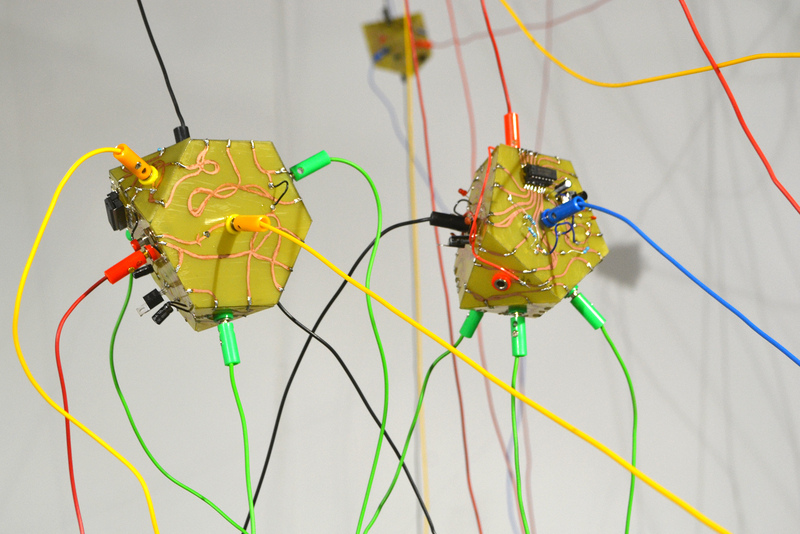 They are built from electronic circuits, drawn, etched and assembled in the form of polyhedra. Connections between elements are identified by a color code according to the type of information or function they convey (ground, power, audio signal, modulations of synthesizers, sensors). Several modules are equipped with microcontrollers programmed to manage various effects of spatialization and sound modulations. Informations of sensors installed on some modules are re-injected into the system in order to generate a data feedback effect, and make the whole unit autonomous. Accentuated by the quantity of wiring and non sense electronic schematics, the result is a global installation that generates a sound symphony whose musicality is not planned in advance. Each module operate independently while influencing the global system, without being driven by a "mistress" artificial intelligence seeking to produce an overall sound coherence. A wide range of sound effects and movements are exploited by algorithms, but also triggered by sensors to introduce several chaotic components into sound creation, both in its temporal structure and in its variations. In this way, the system generates a form of nonlinear composition and each time unique, whose musicality is subject to many factors of chance. 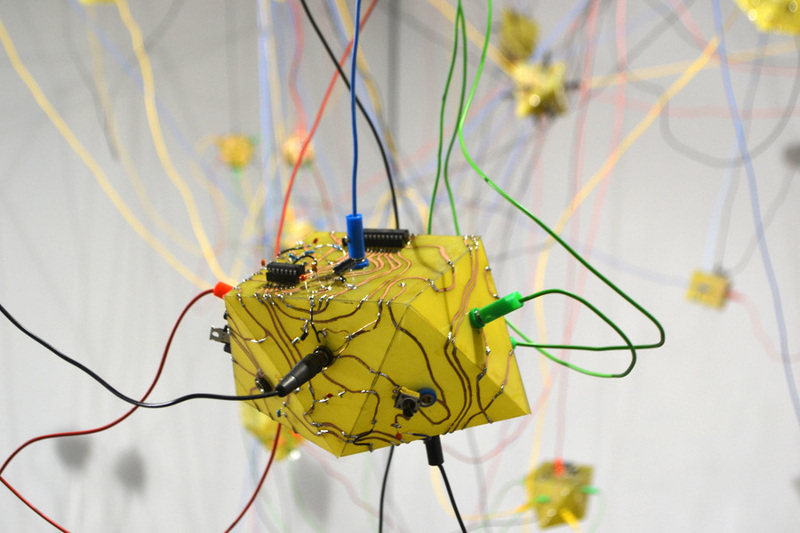 It is currently composed of more than 40 modules, new pieces are being designed to extend the sound and interconnections possibilities. Synthesizer modulation’s controls and sound spatialization are managed by ATmega328 microcontrollers installed on some modules. The microcontrollers are programmed in C / C ++ language in the manner of a Arduino board. Synthesizer modules are directly inspired and built as a modular analog synthesizers. Variable resistors that generate the sound variations are replaced by a multi channels digital potentiometer controlled by a microcontroller. Sounds generated by the synthesizer modules pass through two modules dedicated to spatialization, which sends them back to one of the dozen modules-speakers. In order to stay in the spirit of analog modular synthesizers, the implementation of the sound spatialization was imagined with the constraint of using a non digital process. Modeling and computer development by Frédéric Villeneuve-Séguier. Project funded by the Direction Regionale des Affaires Culturelles de Midi Pyrenees as part of a creation grant.